Blue nose pit bulls are a handsome color variation of the American pit bull terrier, with charcoal gray noses, blue eyes and blue-gray coats. Just as with any pit bull, it is important to raise your dog with consistency, patience, love and leadership. This breed grows into a large and energetic dog, so proper training and obedience during your dog's puppy-hood is crucial to giving it a bright future with your family. Socialize your pit bull puppy as much as possible by exposing it to lots of people, places, sights, sounds and other animals, making sure the experiences are positive and enjoyable for your dog. Between the ages of seven to 16 weeks is the most important period for this, since the experiences your dog has at this stage will affect how it reacts to new situations for the rest of its life. Train your dog consistently from the first day you bring it home. Always use gentle, positive training methods, but be firm in your leadership. This teaches your dog to trust you and listen to you, which will be of great value as it grows into a large, rambunctious dog. Spay or neuter your pit bull at the age recommended by your veterinarian. Even the unique blue coloring of your pit bull can be found on homeless dogs in shelters everywhere. Do not add to the overpopulation of pit bulls. Spaying and neutering will also reduce your dog's hormones, making it easier for your dog to stay focused on you. Exercise your blue nose pit bull as much as possible. Doing this will drain your dog's extra energy, making it less likely to engage in negative behaviors like excessive barking or chewing around the house. This will keep your relationship with your dog harmonious and happy. Set your pit bull up for success by keeping its safety and the public's safety as a priority. 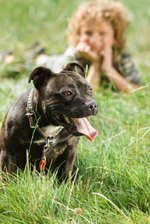 Even the most well-socialized pit bull can get into trouble, and the breed already has a negative reputation. Never leave your dog unsupervised with other animals or young children, and don't use your dog for fighting or intimidation.